In 2012, nearly 12 million consumers loaded more than $64 million onto prepaid debit cards. With so many people turning to these cards, more companies are getting into the prepaid debit business. 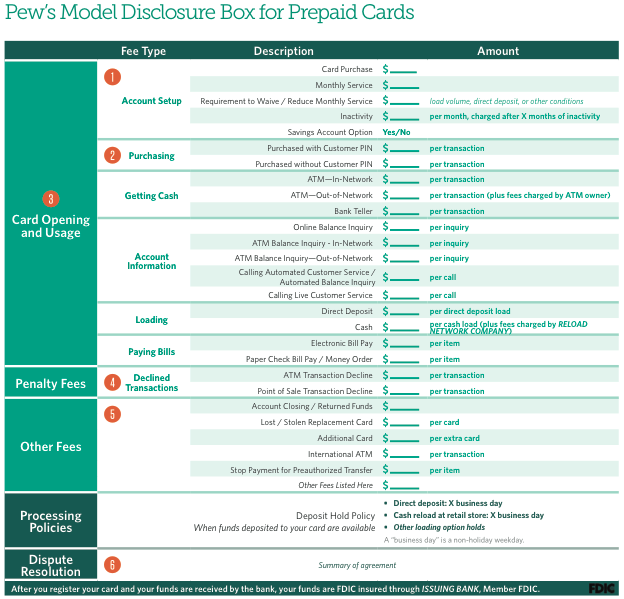 To assist consumers faced with a plethora of card options, Pew Charitable Trusts unveiled a new model disclosure box for easy comparison of prepaid card fees and terms and conditions. JPMorgan Chase announced today that its Chase Liquid prepaid cards will be the first prepaid product to employ the new disclosure box, which fits on the inside flap of the existing card packaging. Uniform, concise, and easy-to-read disclosures will help consumers chose the best card for their needs while navigating through the many prepaid card of options offered by banks, credit union, wireless companies and even celebrities, Pew reports. Pew presented the model disclosure box in a new study, “The Need for Improved Disclosures for General Purpose Reloadable Prepaid Cards” [PDF], detailing the lack of transparency in current card disclosures. Pew researchers found that nearly every one of the 66 cards included in the study failed to disclose at least one type of fee, service, or consumer protection. To develop the disclosure box Pew hosted focus groups in Baltimore, Denver, and Austin. Participants reviews and commented on three disclosure box prototypes. The final disclosure model is based on Pew’s disclosure box for checking accounts, which has been adopted by 26 banks and credit unions. Use of a disclosure box falls in line with Pew’s recent recommendations to the Consumer Financial Protection Bureau to make cards safer. The recommendations were part of two reports released earlier this month by Pew highlighting increased consumer demand for prepaid cards and growing concerns over the lack of consumer protections. •	Prepaid cards should not have overdraft or other automated or linked credit features. •	Prepaid cardholders should be protected against liability for unauthorized transactions that occur either when a card is lost or stolen or a charge is incorrectly applied. •	Prepaid cardholders should have access to account information and transaction history. •	Prepaid cards should be required to provide information about terms, conditions, and fees in a uniform, concise, and easy-to-read format. This information should be included with the card packaging so that it is accessible pre-purchase at retail outlets as well as online. •	Prepaid card funds should be federally insured against loss caused by the failure of an institution. •	Predispute binding arbitration clauses in cardholder agreements, which prevent cardholders from having the choice to challenge unfair and deceptive practices or other legal violations in court, should be prohibited.